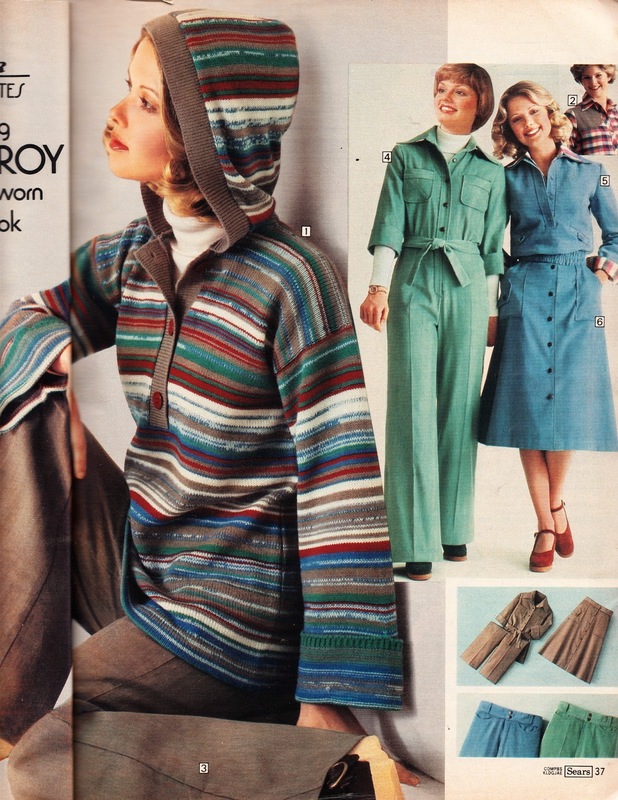 Kathy Loghry Blogspot: That's So 70s - Corduroy! That's So 70s - Corduroy! What am I thinking: two "That's So 70s" Posts in a row! 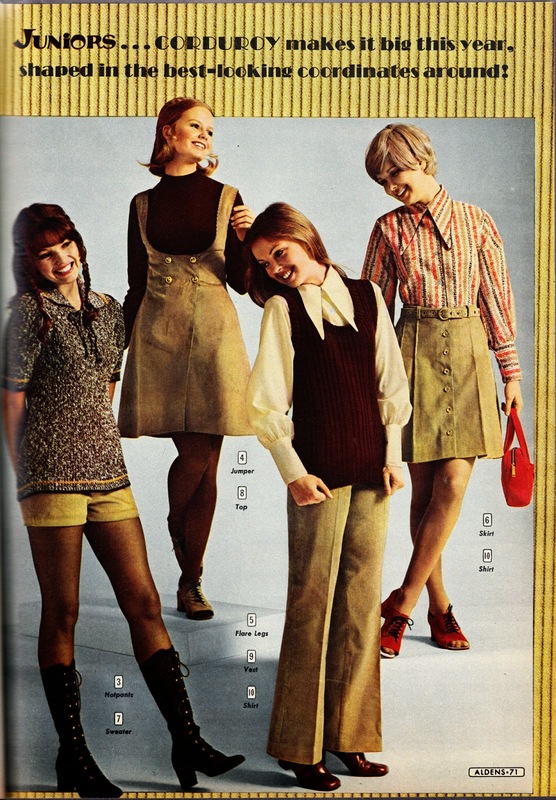 But you have to admit that nothing, and I mean nothing, screams 70s fashion like corduroy. 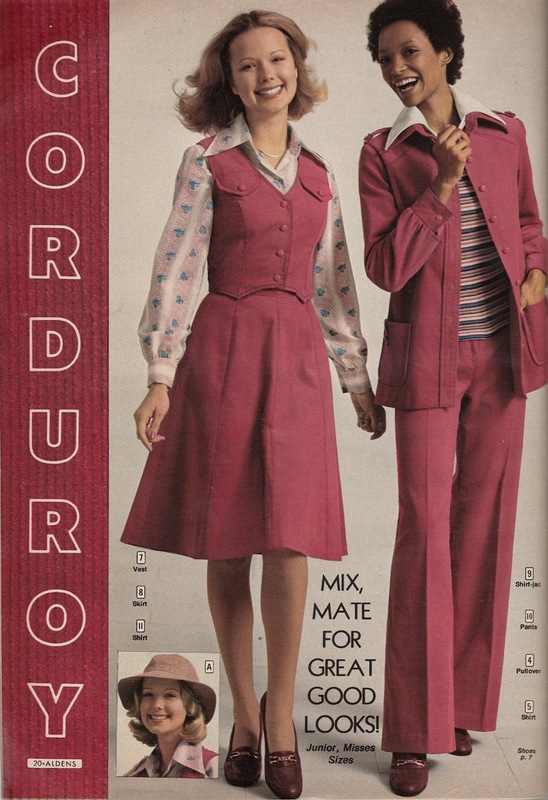 Something about corduroy really caught the imaginations of the fashion world in the 70s. Those tightly wound cords of fabric running side by side just seemed to capture the essence of the age despite the onslaught of man made fibers. The term comes form the French "corde du roi" which means cord of the king. And you can see why in the following pics. The fabric seemed to be the perfect regal answer to the 60s! Yep, this magic fabric could be molded into any shape or color as seen here with Kathy - pink corduroy skirts, vests, jackets and pants. Why I do believe that even that snazzy hat that Kathy is modeling could be as well!! But by far and away the most common use was in pants. What Back-To-School shopping trip was complete without at least two - possibly more - pairs of corduroy pants (usually in different colors)? Yes sir, High Schools and Middle Schools across our fair land were awash in a veritable tsunami of brightly colored corduroy clad students on the first day of class! 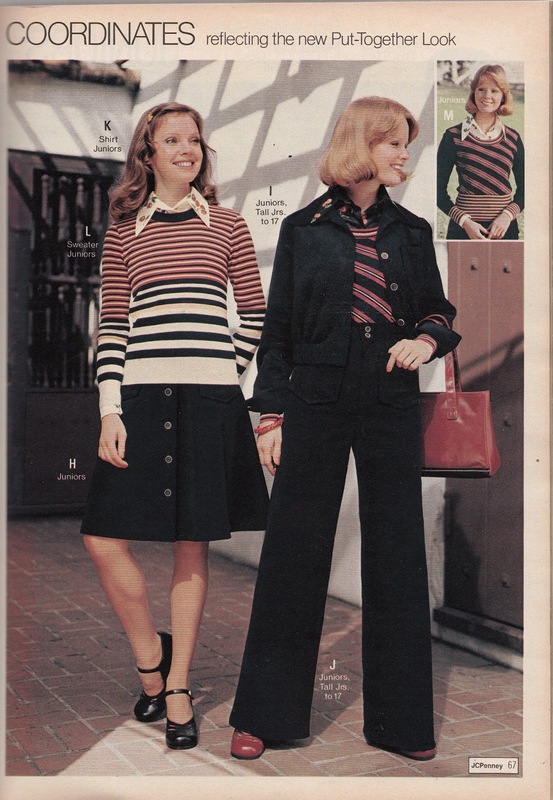 However not even corduroy could escape the 70s penchant for coordinates as seen here. Corduroy came in different types. Here it is pinwale. A wale is a row, and corduroy is defined by its wale number which is the number of rows per inch. The standard is 11, but pinwale is typically 16 so it has a finer feel. Yep, this was the hey day of 70s corduroy. Basically, anything that could be made with corduroy was made with corduroy at some point. Here we have everything from jumpsuits to sweaters in the stuff. While maintaining that semi-regal air, corduroy also had a bit of the laid back casual look to it, which made it perfect for the 70s. 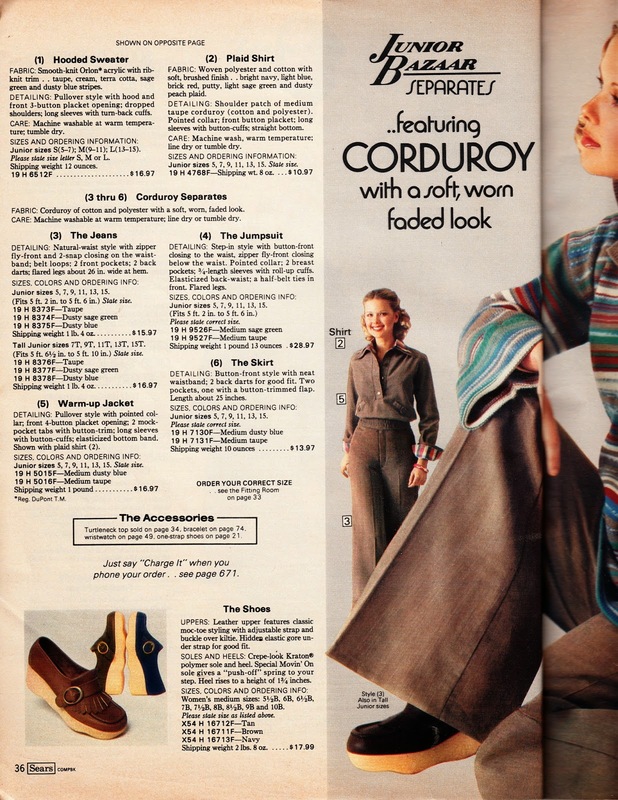 Editors note: I don't know how many times I misspelled "corduroy" while writing this post. Can I FINALLY get it right the first time without the spell checker? Let's see "courdoroy". Rats, dad bern keyboard!! Thanks, I'm glad you enjoyed it. I hpe to have more postings on 70s corduroy in the future! 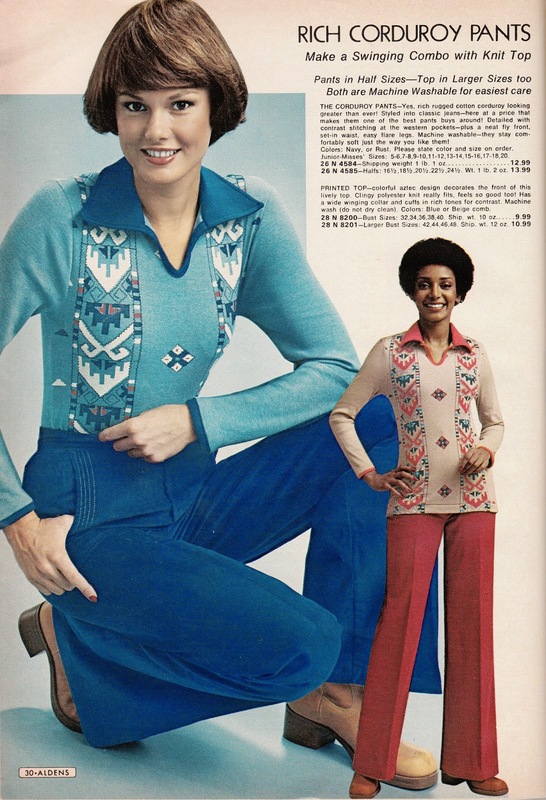 That's So 70s - So You Think You Can Sew! Scintillating Sears Sleepwear - Part 4! Random Goodness - Spring Dresses and Such!